Italian Street Painting festival in San Rafael, CA. Cecelia nears completion of her painting on Sunday afternoon. 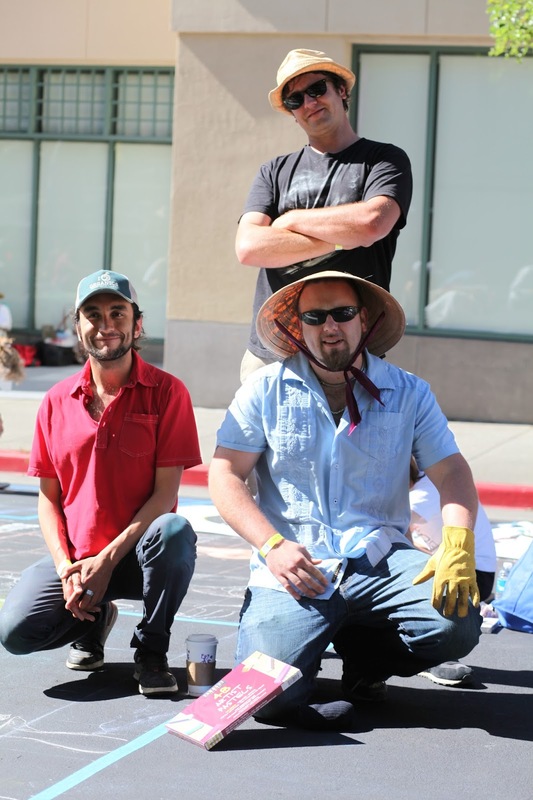 On a blazingly hot weekend at the end of June, I attended the Italian Street Painting Marin event held in San Rafael, California. I had a "press pass" of sorts, since I was acting on behalf of one of the corporate sponsors, Whole Foods Market, as our photographer for the event. This allowed me early access when there was less of a crowd, although I did stay throughout the day on Sunday when the site was swarming with multitudes. 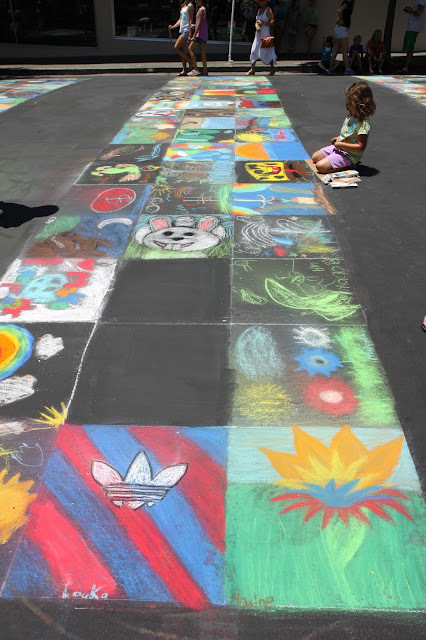 I was pleased to see that the community turned out in force with kids in tow to view and participate in this amazing spectacle where mind-blowingly talented artists toiled under extreme conditions for two and and half days to create giant squares of public art. Included in this post are shots that I took of the activities that progressed over the weekend. Most people would never know that I am an emotional person at heart, since I tend to present myself as even-keeled and level-headed most of the time. But in this venue, buoyed up by the creative spirit of those around me, I was stirred to my core. The art itself, and the conjoined efforts of the group went straight as an arrow to my soul and pierced it with joy. In my state of amazement, I wanted to laugh and burst out crying at the same time. The pieces of art that were created I would liken to Aboriginal, Tibetan or Native American sand paintings... created just to be destroyed. Such was the case here. Artists threw themselves into their projects with gusto and guts, knowing full well that the paintings would be washed down the local sewer by the dawn of the next day. No monetary gain to be had in this effort, just artists doing what they are compelled to do, which is to create Art. To watch it unfold before my own eyes was indeed... extra-ordinary. In fact, the word magical comes to mind. 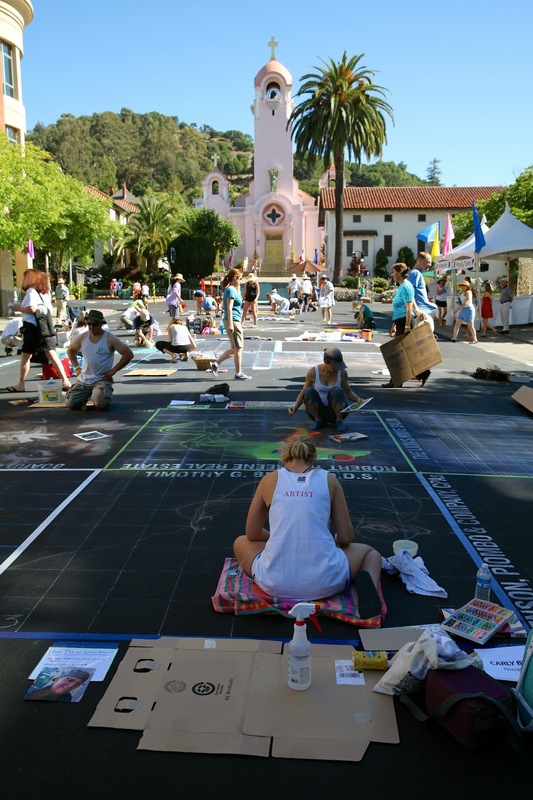 Misson San Rafael Archangel was the site of the Marin Italian Street Painting Event this past June. I go crazy for red! The Goddess of Art pours magic and inspiration onto the site of the event in this popular mural. An Artist begins her square on Saturday morning. I snapped this shot early in the day. Music and dancing ensued later in the afternoon. An energetic couple loved the Zydeco and danced vigorously in spite of the mid-day heat. I was taken with the work of artist Joyce Rietveld who is a landscape designer when she isn't painting. She said that this was her fourth show. I was intrigued by her tree tattoo, and she was as much fun for me to photograph as the colorful amphibian that she was working on. Chalk artist and landscape designer Joyce Rietveld. against the day to complete her painting. In the photograph below are my co-Team Members from Whole Foods Market. Alex is a very talented painter and musician. I like his work so much in fact, that I have purchased two of his abstract oil paintings recently, which I now have hanging in my home. I had seen the preliminary sketch that he had planned for the piece, and so I was very excited to see how the painting would come together. Alex is not experienced with using pastels, so there was definitely going to be a learning curve involved. I thought he and his co-artists did an admirable job. I loved the painting of the Marin goddess of the wetlands and mountains, who can harness the power of the Sun in her strong hands. Alex said the experience was rewarding in spite of the scorching heat, and he is looking forward to next year. get hydrated in preparation for a long and grueling day in the heat. Artist Alex Zelnick designed and painted a piece for the Whole Foods Market sponsored square. Alex works in the local San Rafael store. The chalk painting wasn't quite finished when I left in the late afternoon having wilted in the heat. Alex persevered on solo for a couple more hours until the end of the day on Sunday... the final day. It was so interesting and fun for me to see this rooster being created by local artist Beth Renneisen take shape from the initial graphing process through near completion. The rooster emerged from the asphalt cocky and colorful. Artist Beth Renneisen of Fairfax, CA makes her initial sketch on Friday afternoon. Beth gets some support on Sunday afternoon... that rooster is looking ready to crow! Many of the Madonnari painted madonnas, and that is how they received the title that has traveled with them into modern times. Bruno and I did encounter a bit of a language barrier, but I was able to obtain a business card and promised to send him photos. Bruno Fabriani attended from Italy. He is a street painter by profession where they are called Madonnari. Madonnari's got their name from painting Madonnas. Bruno in the late afternoon on Sunday heading toward completion of his amazing piece. So beautifully in its simplicity and boldness! I was so very sorry that I didn't get to see this Lady of the Dead completed. 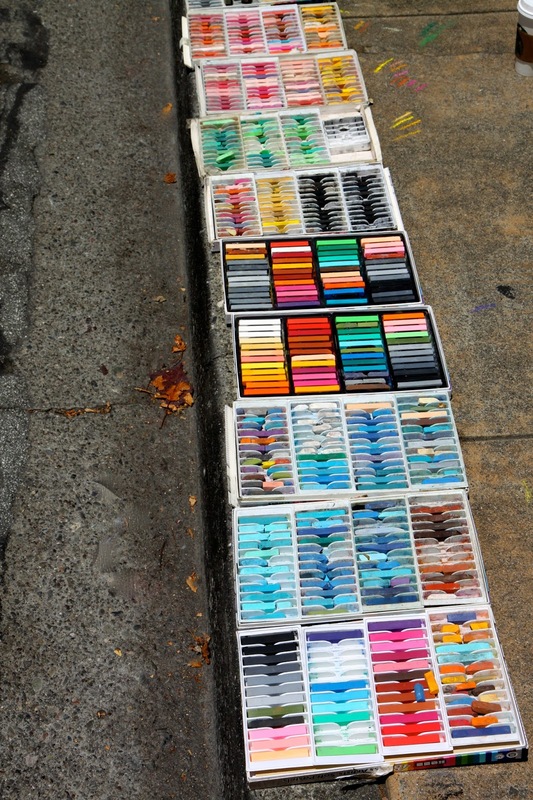 Seeing these colorful pastels laid out on the curb made my heart glad. I was amazed at the speed with which this painting was finished. Beautiful! I am always a sucker for the Pre-Raphaelites. This was a beautiful reproduction. As fate would have it, turns out that I was to suffer for my art as well. A few days after my shooting marathon at the Italian Street Painting weekend, during which I wielded not one but two cameras, I came down with a nasty case of "camera elbow". It sounds much more benign than it actually is. My elbow was hot and swollen and I had shooting pains down into my hand. Having to wash my hair with one arm and barely being able to dress myself was no fun at all. Thankfully, I was better in just a few days, and could resume sleeping. But knowing the outcome would be the same, would I do it all again next year? The answer is this... in a heartbeat. A little girl finishes her square in the kid's art section. Buttery and crispy garlic bread is certainly on my top ten favorite foods list. We sisters love us some garlic bread. In fact, I really don't know anyone who doesn't except for Kirk Douglas, perhaps. Being from the Santa Ynez Valley, garlic bread was, and still is a staple at the renowned Tri-Tip barbecue, where you will find it along side the salsa fresca and the pinquito beans. These days we girls all make it with our homemade sourdough baguettes. If you choose not to make your own bread (see the link below for our recipe for French baguettes), don't fall for that soft "bread" in the plastic bags on the grocery store bread shelf. Any artisan baguette will yield great results. 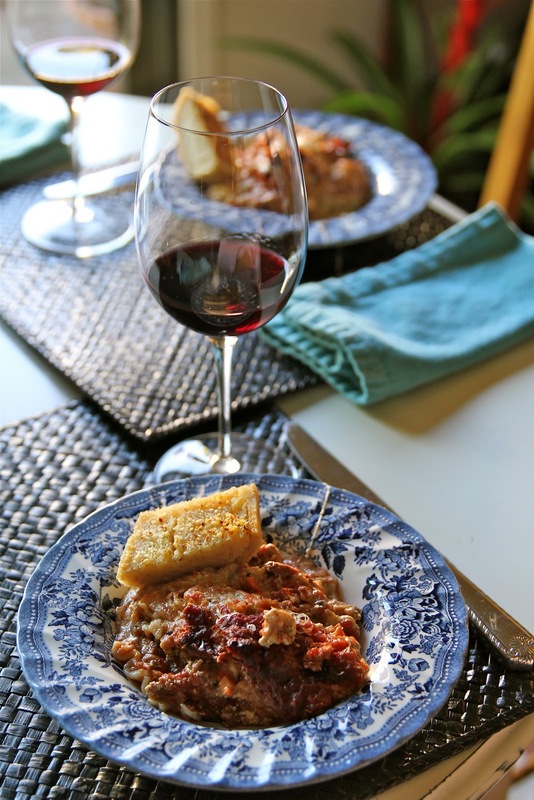 Lasagna, garlic bread and red wine - a classic Italian combination. 1. By far, the easiest way to make the garlic butter spread is in the food processor, but the garlic can be chopped by hand and all the ingredients mixed up with a fork if one isn't available. The butter spread can also be made up ahead of time. It is a good idea to refrigerate it if it is going to be used the following day and then allow it to become warm so it will be a spreadable consistency. 2. Preheat the oven to 350°F. For the food processor method, insert the steel blade in the food processor and turn on the machine with the blade running. Drop in the cloves of garlic, and keep the blade running until the garlic is completely minced and stuck to the sides of the bowl. Then remove the the lid and add the butter. If the butter is cold chop into small squares. Scrape down the sides of the bowl until the garlic is completely incorporated into the butter and the mixture is creamy. Then with the motor running, I pour in just enough olive oil to make the mixture extra creamy and light. 3. Cut baguettes in half lengthwise and then slather butter mixture on the top. Then assemble the bread back together. Wrap tightly in foil and bake for 20 minutes on a cookie sheet. I rotate the loaf once turning the bottom to the top during this part of the oven cooking. After 20 minutes remove from the oven. The bread can be held for an hour at this stage of the cooking. Just before you are ready to serve, unwrap the loaf and place each half butter side up on cookie sheet. This is a good time to sprinkle on paprika, herbs or crushed pepper. Broil for a few minutes until the top is slightly charred and bubbly. Alternatively, each half can be placed butter side down on the grill until there are grill marks and the tops are browned. This is when I grate on the fresh parmesan, but you can broil it if you like. Cut into slices and serve immediately. Ready to be sliced and devoured. Such an interesting and wonderful post. I loved learning and seeing Italian Street Painting. I agree, who doesn't love garlic bread? I make mine with Juliette's Classic Baguette. Then your garlic bread must be amazing, Christy. Juliette, so we hear, makes the best bread in Bisbee! Thanks for reading and buying our sister's bread. Thank you so much for the beautiful words spoken about my work and the ancient art of Italian Pavement. Thank you for your hospitality. It was my great pleasure to see your beautiful art. Thank you so much for sharing your art and talent with us all!